Danish sounsters at Bang & Olufsen have launched a quirky-looking speaker set, subwoofer in tow, to spice up your living room sound system. The oddball BeoPlay S8 takes its aesthetic inspiration from the BeoLab 14, and comes courtesy of Scandinavian industrial designer Torsten Valeur. The sculptured 8-inch tower subwoofer apparently pumps out pretty convincing bass for its size, and caters for a low-end frequency range of 20-150Hz. The bass-boosting cone also has its own dedicated 280W amplifier to help push really powerful sound. The BeoPlay S8 also ships with two smaller satellite speakers, each touting 2.5-inch full-range drivers. The circular satellites are both powered by their own smaller 140W amplifiers. T3's not had a chance to try out the speakers just yet, but the specs certainly bode well for decent tuneage. In true 21st century style, the S8 system will connect to streaming hubs like Apple's AirPort Express or Sonos Connect, alongside pretty much any other streaming device. 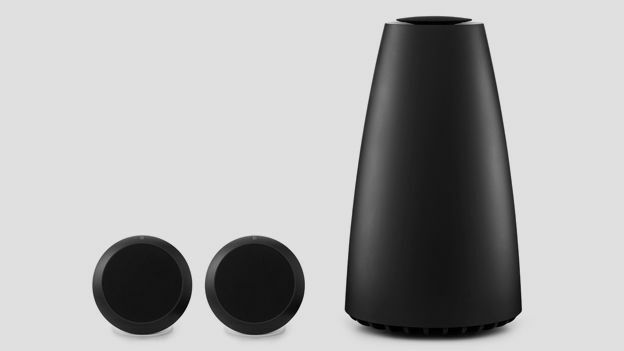 B&O says you can pair the speakers up to its TV sets too, giving your home cinema system a hefty audio boost. The BeoPlay S8 is available in the UK right now, ships in witch-hat black, and marks up at a wallet-chunking £999 - but then, it does look ruddy awesome.